The purpose of the noxious weed program is to help the public control noxious weeds that may become established on their property. Our main objective is to provide management assistance to farmers, landowners and homeowners. Acceptable control of any of the six noxious weeds is expensive, time consuming and requires intensive management. 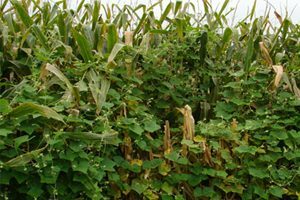 The Noxious Weed Unit of the Plant Industries section has information available on specific treatments, both chemical and mechanical, which can provide control of any of the noxious weeds. There are currently six plant species that have been designated as noxious weeds in Delaware. Delaware law requires that these weeds not be allowed to exceed 24 inches in height or be allowed to produce seed. Palmer amaranth, Amaranthus palmeri, designated in 2012. The Plant Industries Section has an equipment loan program to further assist the public in the control of the six noxious weeds. The Department of Agriculture owns several pieces of herbicide application equipment, which is available, at no charge, to farmers and other qualified individuals for the control of noxious weeds. This service has been very popular as it allows the landowner to control the weeds without making a large financial investment in specialized equipment and it increases compliance with the weed law. “Persons” mean any individual, partnership association, fiduciary, corporation or any organized group of persons whether incorporated or not. “Noxious Weed” means any species of plant or parts of plants, that have been designated by the Department, under Chapter 24, Title 3, Delaware Code, as having adverse effects or threaten agricultural production. DESIGNATION OF SPECIES; INVESTIGATIONS; CONTROL PROGRAMS; GRANTS; WEED ADVISORY COMMITTEE. The State Department of Agriculture may make such investigations studies and determinations as it may deem advisable in order to ascertain the extent of growth and infestation of noxious weeds in this state, and the effect of such species on agricultural production. The Department may institute programs of control and eradication. The Department may enter into agreements with any county or subdivision of this State, with any adjoining state, or with agencies of the federal or state governments to affect a program of control and eradication. When such an agreement is executed and certified in writing to the Secretary of State, the Department and the county may conduct surveys to determine the location and amount of infestations of designated noxious weeds within that county, and may provide technical and financial assistance to landowners in a cooperative control or eradication program, and may affect a program of mowing, spraying, or other control or eradication practices on road right-of-ways, drainage ditch banks, parks, playgrounds, and other public or private lands. The agreement between the Department and county may be terminated by either party on 30 days written notice. (3 Del. C. 1953, §2403; 57 Del. Laws, c. 701). The Department may accept, use or expend such aid, gift, grant, or loan as may from time to time be made available from any source, public or private, for the purpose of carrying out the provisions of this chapter. The methods of operations by the Department shall not be limited to those specifically listed in this section. It shall be unlawful to import designated noxious weeds into this State, or to transport designated noxious weeds within this State, in any form capable of growth, except for purposes of research with the prior written approval of the State Department of Agriculture. It shall be unlawful to knowingly contaminate any uninfested land or roadway with designated noxious weeds through the movement of rootstocks, seed, soil, mulch, nursery stock, farm machinery, or other medium. It shall be unlawful to knowingly allow designated noxious weeds to set seed on any land, or to allow any portion of a designated noxious weed plant to reach a height or vine length of 24 inches; and it shall be the duty of each landowner or person who has the present right to possess and/or use the land to mow, cultivate, treat with chemicals, or use such other practices as may be prescribed by the Department of Agriculture as effective in preventing seed set on designated noxious weed infestations or in elimination of the designated noxious weed plant. An exemption from prosecution is allowed by the Noxious Weed Law. To be exempt a landowner or person who possesses or has the use of that land must enter into a written agreement, commonly known as a compliance agreement, with the Department of Agriculture. The agreement must specify terms and conditions of a program for the control and eradication of designated noxious weeds and the land that is covered. So long as all the terms and conditions are being complied with, there is no violation of this chapter as to the land covered by the agreement. Failure to comply with the provisions of this chapter may result in the assessment of a civil penalty. No civil penalty shall be imposed until an administrative hearing is held before the Secretary or his or her designee after due notice (20 days) has been given to the landowner or person who possesses or has use of the land in accordance with Chapter 101, Section 10122 of Title 29. All hearings which are held to enforce the provisions of this chapter shall be conducted by the Secretary or his or her designee. The landowner or person who possesses or has use of the land shall have the right to appear personally, and to be represented by counsel, and to provide evidence and witnesses in his or her own behalf. The Department shall preserve a full record of the proceeding. A transcript of the record may be purchased by any person interested in such hearing on payment to the Department the cost of preparing such transcript. The Department shall issue a decision in writing to the landowner or person who possesses or has use of the land within 30 days of the conclusion of the hearing. Any individual who feels aggrieved by an action of the Department as a result of an action resulting from a hearing held under this chapter may make an appeal, within 30 days of such action, to the Superior Court, and after full hearing the Court shall make such decree as seems just and proper. Written notice of such appeal, together with the grounds thereof, shall be served upon the Secretary of the Department. Any person who interferes with the Department of Agriculture in the enforcement of this chapter as determined in an administrative hearing, shall be assessed a civil penalty of no less than $50 nor more than $500 on each count. Any person who refuses to comply with the provisions of this chapter shall be assessed a civil penalty of a minimum of $100 or $25 per acre of land upon which noxious weeds have seed, whichever is greater. The proceeds of any fines or penalties imposed under his chapter shall be deposited into an appropriated special fund account in the Department of Agriculture. These funds shall be used to support the noxious weed eradication programs of the Department of Agriculture. The Department of Transportation shall cut down, or cause to be cut down, noxious weeds growing in the rights-of-way over which it has charge or supervision, as often in each year as shall be sufficient to prevent them from going to seed. When particular problem areas have been identified, they shall be sprayed to eradicate the weed. (64 Del. Laws, c. 2851 §1). Todd Davis at 302-698-4581 or via e-mail at Todd.Davis@delaware.gov. All calls will be handled confidentially.